Come on down on Saturday, May 12th to 2220 Village Walk in Henderson at the Coffee Bean and Tea Leaf from 10am to 1pm for a day with the authors! Cant wait to see you all there! Come join us Saturday, May 19th at 9708 Gilespie Street. You can get free food just by purchasing a book! You wont want to miss this! Hope to see you all there! Sunday, April 29th, 2:30pm to 4:30pm … it’s a date!! Please remember … this is a FUNDRAISER. Let’s raise Alzheimer’s awareness. Let’s help dispel the stigma attached to Alzheimer’s. Let’s help our fellow Nevadans. Let’s promote each other’s books and have a selling good time. Get your flyers out and about via social media. Let’s make this our very best fundraiser for Alzheimer’s Nevada. Who do you know that knows someone with questionable memory or a caregiver that wants to learn more and help our cause? Contact them, will ya? ## Go online, “like” Enchanted Forest Reiki Center. Debbie is generously donating the venue. Let’s tell our social media about her gift store and services. ## Allow a few minutes to set up before guests arrive, 2:15pm the latest. ## Pictures taken before our “show” begins. ## We all have five minutes to talk about our books. ## Alzheimer’s Heart-to-Heart Conversations available. Albert from Alzheimer’s Nevada may be able to pop in and say “hello”… great! ## $15 plus 20% of books sales paid to Nancy at end of event. More gratefully accepted. I hope you know, very gratefully. 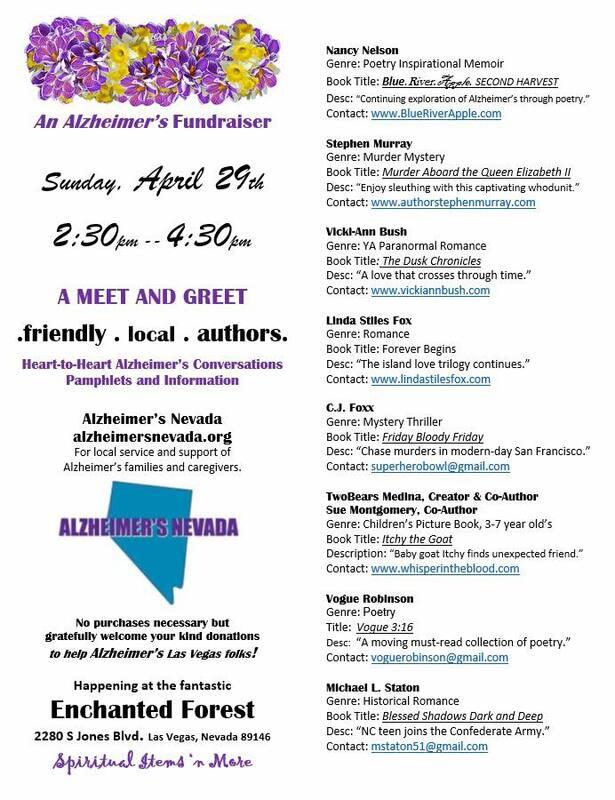 Listen, friends, I so admire you for saying “yes” to our special book signings highlighting Alzheimer’s Nevada. You are always so generous and responsive to our cause. I couldn’t do it without you authors, Stephen, and Debbie. THANK YOU, and THANK YOU, and THANK YOU from the bottom of my heart. Truly. I would like to invite you all to join me! Get a cup of delicious coffee, a one of a kind book and a signature! What could be better? Hope to see you all there! Event will be held at Paseo Verde Library located at 280 S Green Valley Pkwy, Henderson, NV 89012 on Sat. Mar. 17th 1 pm-3:30 pm. I am excited to see you all there! Event will be held at Bad Owl Coffee Shop located at 10575 S. Eastern Ave on Sat. Mar. 31st from 10 am-1 pm. Hope to see you all there! Win an E-copy of My New Book!! CONGRATULATIONS to the four winners!!! Your copies are on their way! 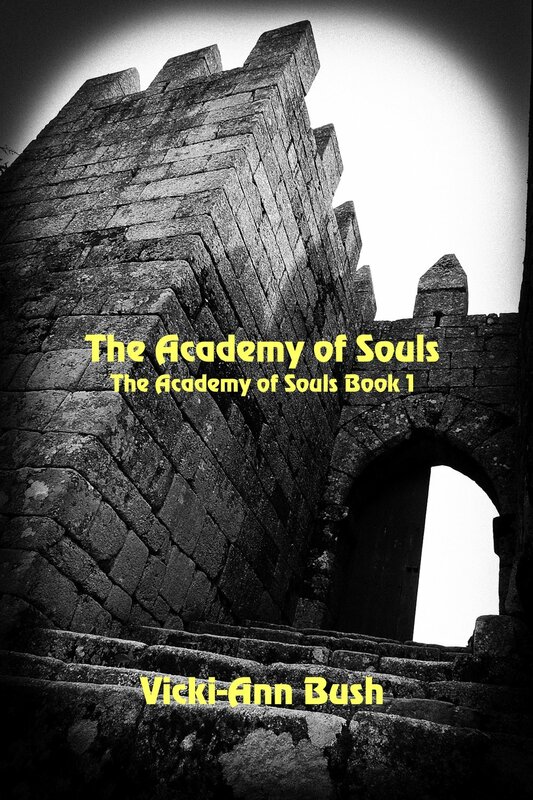 The Academy of Souls is my new book live today, Tuesday, January 9th! I will be happily giving away 4 ebook copies! Below I have attached a link where you can go to be eligible for one of these copies! Good luck to everyone and I look forward to hearing from you all. I will be at Barnes and Noble on Sunday Feb. 11th doing an author signing. The Barnes and Noble is located at 567 N. Stephanie Henderson and the signing will be from 1:00 p.m. - 4:00 P.M. I look forward to seeing you all there! 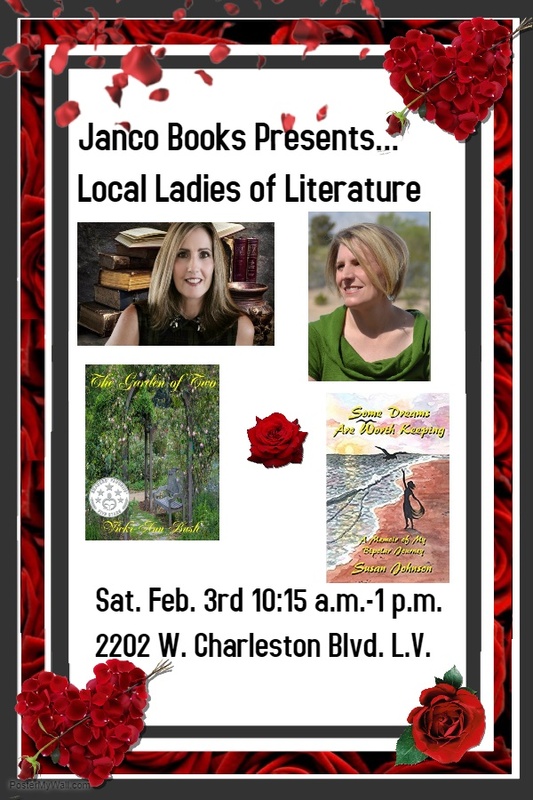 Come one, come all to the author signing on Saturday Feb. 3rd at Janco Books located at 2202 W. Charleston Blvd. L.V. The event will be from 10:15 a.m. - 1:00 P.M. Hope to see you all there! Come join us at the Boulder City Library 701 Adams Blvd B.C., from 1:00 - 3:00 pm on Saturday January 20th! Please scroll down to #24 in the archives to listen to my segment. As a traditionally published author, this subject interested me immensely. I was very excited to be a guest and not only learn the aspects of self publishing, but also have input to the differences between self publishing and traditional publishing. 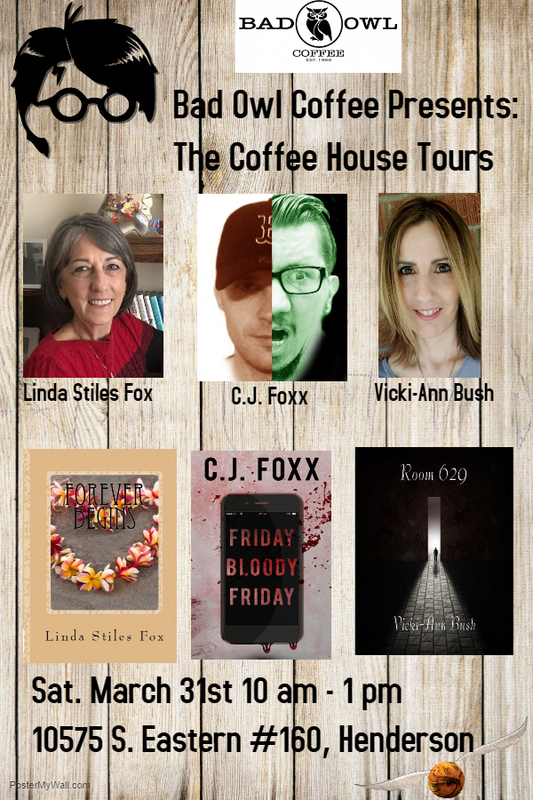 Meet the Authors at Coffee Bean! Mothership presents meet the authors signing! NorthWest Book Festival Portland, OR. Great fun for the family! Saturday July 29th 10 a.m. - 5 p.m.
at Downtown's Pioneer Courthouse701 SW 6th Ave. Portland, OR. Authors Signing & Selling books! Join myself and Susan Johnson for a morning of books, conversation and coffee. We will be at Mother Ship Coffee 2708 N. Green Valley Pkwy from 10 am - 12 pm on Tuesday November 8th. Susan will be featuring her book, Some Dreams are Worth Keeping a memoir of her Bipolar Journey. And I will be showcasing my Sci-Fi, Room 629. An eerie tale of the unknown and world changing events that start off in Primm, Nevada. Las Vegas and Henderson, come out and say hello! I'll be at Barnes and Noble 567 N. Stephanie from 1 pm - 3 pm and the book featured for the day will be my Sci-Fi, Room 629. So if you miss Halloween already and need and extra dose of spooky, come and check it out! Yay, National Pet Day. Here's my babies, post a pic of yours in the comments. #IWishIHadAnExtra 100 years with the ones I love.